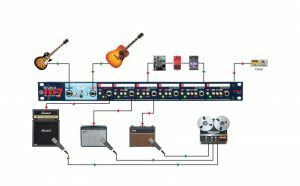 The JD7™ is a guitar signal splitter that is able to drive as many as seven amplifiers at the same time without introducing noise, signal loss, or hum and buzz from ground loops. The JD7 allows you to feed up to seven amplifiers simultaneously, with premium Jensen transformers on the outputs that ensure distortion-free signal transfer while blocking hum and buzz from ground loops. To help retain the natural tone of your instrument, Drag control load correction is also featured on the input so you won't lose the tone and feel of connecting your guitar directly to an amplifier. 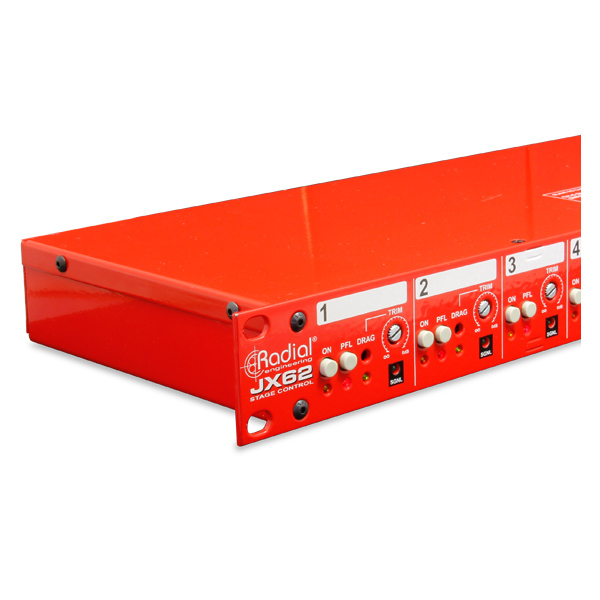 The JD7 has a built-in Radial DI box, so you can take a clean guitar track directly to your recording interface while simultaneously playing through multiple amplifiers. 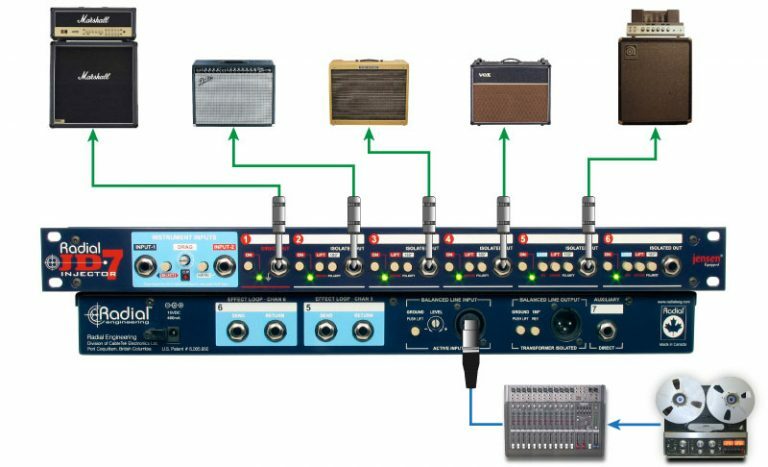 A Reamp input allows you to send your recorded guitar track from your recording device back through any or all of your amps, so you can focus on the performance and have the freedom to tweak your amps and microphones later on. The JD7 is equipped with A or B inputs and 6 guitar outs on the front panel plus a tuner out on the rear. 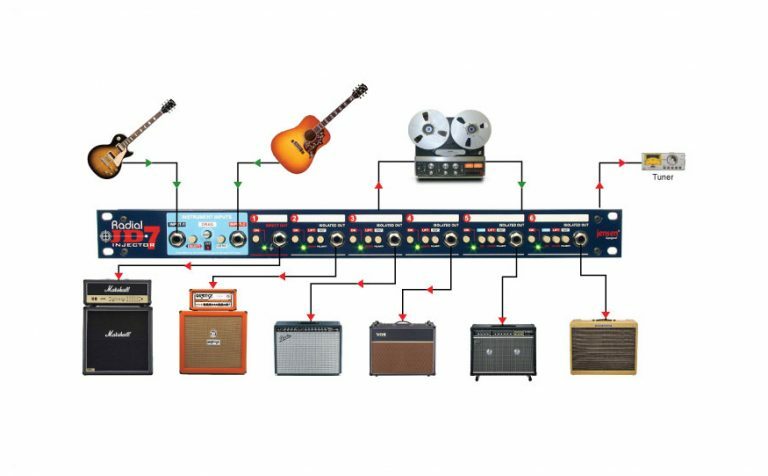 Use ch-1 with a properly grounded amp, then add as many as you like. All outputs are isolated to eliminate hum and buzz. Start by recording a dry track using the JD7's DI output. Then send the clean track back to the Radial JD7's rear panel XLR input. 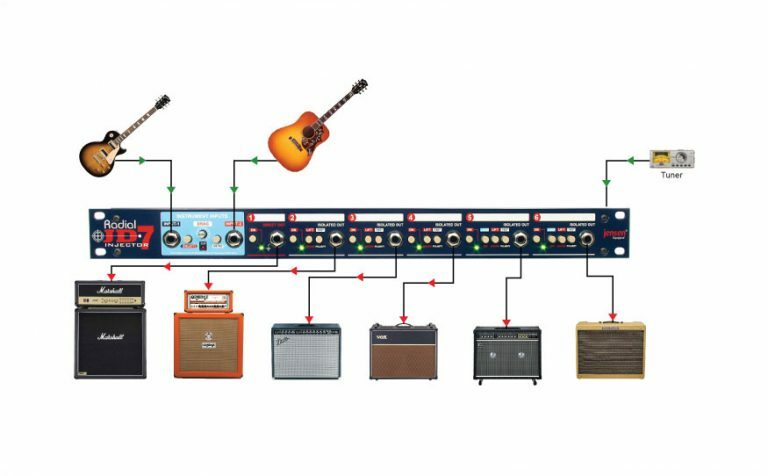 Adjust the level and you are now set to drive as many amps as you need. Move the mics, change the tone settings. 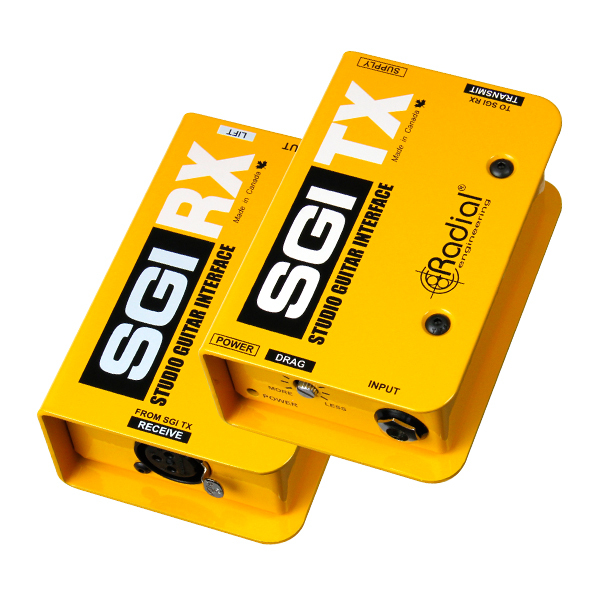 A great way to quiet down noisy guitars is to run all your signals through the JD7. The high performance class-A buffers and Jensen transformer isolated outputs are truly amazing! Channels 5 and 6 are also equipped with effects loops. "Every couple of years I come across a piece of gear that makes me wonder how I ever made records without it. It took one day in the studio with the Radial JD7 to realize that it that belongs on this list. Splitting the guitar signal without degradation was impossible before the JD7. Now it's a breeze. The JD7 is amazing. I am not going to give this one back." "The JD7 sounds incredibly clean, due to its Class A circuit. It's also free of buzz, thanks to its Jensen transformers, which provide optimum fidelity and 100 percent signal isolation... The JD7 simply steals the show. 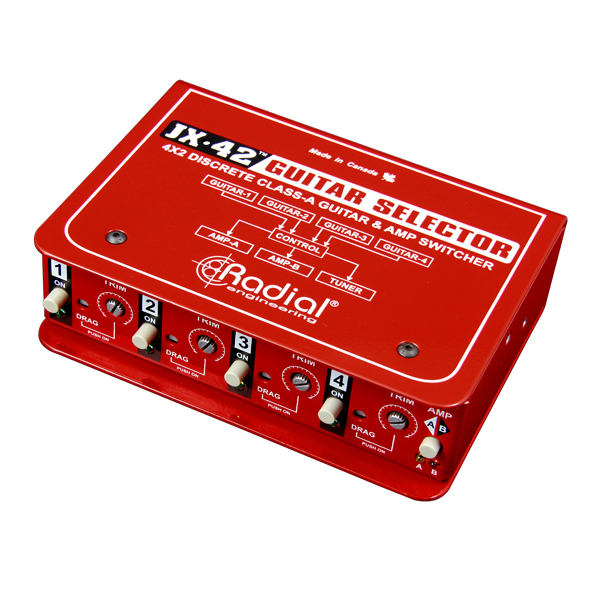 With outstanding tone, flexible routing and superior construction, it is worthy of a place in any guitarist's studio." "This thing is built to last forever and put big dents in anything it's dropped on... Construction is of the highest quality and the sound is great too... the JD7 does a great job and is a powerful tool." 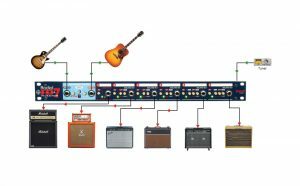 "If you've experienced the time consuming process of waiting around while the guitarist plugged into one amp after another trying to find the "perfect" sound, you'll know the value of a box like the JD7." "The tone was so thick you could cut it with a knife, and the stereo-or surround- possibilities are endless... This thing is addictive!" "The JD7's sheer amount of routing options - combined with its ability to effectively deal with a variety of sonic gremlins - makes it an essential tool for any studio with a herd of unruly amps to wrangle." "I had a blast with the JD7. 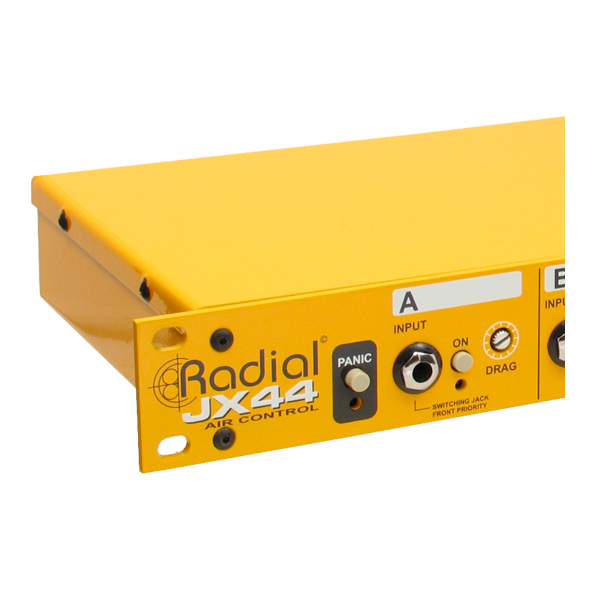 Radial Engineering has achieved their goal of designing a fun, creative tool for making new guitar sounds. It would be a great piece of gear if it only did one thing; that fact that it performs so many functions (and does them so well) is an amazing bonus." "The Radial JD7 is phenomenal! I have been looking for something like that since the sixties. The Drag™ control is very useful in the way it can be used to sweeten the sound and make the input very attack sensitive. A great piece of gear for a guy who likes to use multiple amps." "The JD7 proved to be a real asset during the recording and the best part was that my tone and the guitar's response remained true. I purchased it after we were done!"